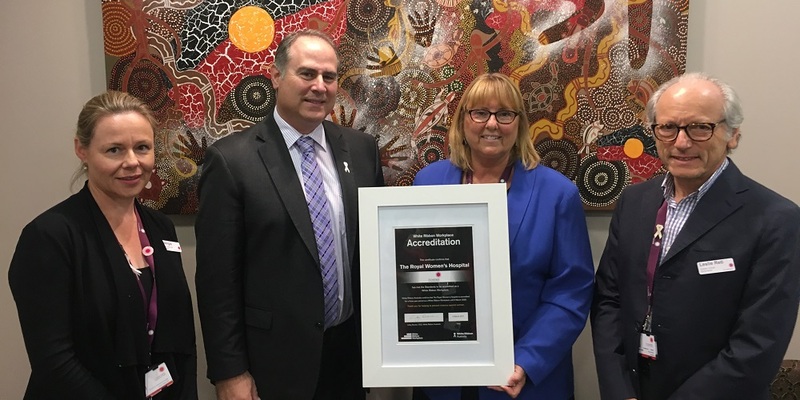 The Royal Women’s Hospital has become one of the first Victorian hospitals providers to receive White Ribbon workplace accreditation for its extensive efforts to support employees who may be experiencing family violence. The accreditation also recognises the Women’s efforts in raising awareness of family violence and advocating for the prevention of violence against women. The Women’s CEO Dr Sue Matthews said staff see and hear the stories of family violence every day and support patients, but some may also be living with violence at home. The Women’s has more than 3500 employees, students and honorary appointments and around 90 per cent of its workforce are women. Its employees receive 20 days of additional leave per year (pro rata) to use for appointments and court dates to help support them though their experience of dealing with family violence. “Addressing gender inequity as a driver of violence against women is essential for any workplace but particularly important for the Women’s as a leader in this area. It is important to see men stepping up and standing alongside women in the campaign to support gender equity as they acts as role models for other men in our community,” said Professor Kelsey Hegarty, Professor and joint Chair of Family Violence at the Women’s and University of Melbourne. The Women’s Clinical director and White Ribbon Ambassador Associate Professor Les Reti said the Women’s leadership had been active in fostering an environment in which employees could feel safe to discuss their experience and be supported should they be experiencing family violence. “Family violence is a community issue and takes a community response, including from those in the workplace. With one in four women having experienced violence from an intimate partner, it is crucial our hospital takes a leading role in supporting our staff,” Assoc Prof Reti said. The Women’s is leading state-wide training and implementation of the Strengthening Hospital Responses to Family Violence, a program designed to train healthcare professions and implement processes that equip healthcare providers to better respond to family violence amongst patients.